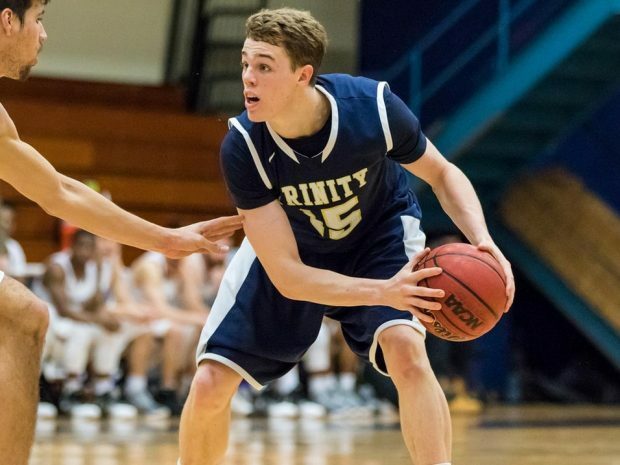 The Trinity College Men’s basketball team dropped a NESCAC semifinal contest on Saturday to the Middlebury Panthers, but not before capturing an electrifying win against cross-state rival Wesleyan in the quarterfinals on Feb. 18. Both games saw a lot of fight from the Bantams, however the Panthers were just too much, likely putting an end to Trinity’s season (barring an at-large bid to the NCAA tournament). Postseason basketball began for the Bantams on the campus of Wesleyan University after Trinity received the 5th seed in the 8 team NESCAC tournament. Wesleyan, the 4th seed in the tournament, had previously beaten Trinity on Jan. 14. Passionate fans for both teams made this a very loud and intense basketball game. Wesleyan, just as in the first meeting between these two teams, got out to a very fast start, automatically putting the Bantams in a difficult position for a road game. However, the Trinity defense persisted, leaving only a 6-point deficit at halftime. Scoresheet leaders for Trinity were Eric Gendron ’18 and Chris Turnbull ’17. Gendron wound up with 13 points and 5 rebounds, while Turnbull had 12 points and 6 rebounds. Amid offensive struggles, Ed Ogundeko ’17 wound up with 8 points and 13 rebounds. With Langdon Neal ‘17 on the bench for foul trouble and Ogundeko struggling to solidify a post presence, the Bantams were down by 6 and looking depleted when Gendron made a field goal and 4 straight clutch free throws to tie the game back up. After two missed free throws from the Cardinals and a charging foul incited by Jeremy Arthur ’19, the Bantams had the ball with 17 seconds left and a chance to win it. After taking the ball down the court, Gendron fed the struggling Ogundeko who spun through the lane and put up a heroic shot that went down with 1.2 seconds remaining, redeeming what was a difficult game for Ogundeko and giving Trinity an improbable 51-49 victory. The magic did not persist however, as the Bantams lost to the Middlebury Panthers for the second time in 3 weeks on Saturday. Playing at Tufts University’s gymnasium, the Bantams played a much more solid game offensively than the quarterfinal matchup, but the 9th best team in the country was just too experienced, defeating Trinity 76-60. Coming into the game, Trinity’s Ed Ogundeko needed 20 rebounds in order to reach an unprecedented 1,000 for his career. The Panthers clearly had a game plan for Ogundeko though as the senior would not make a field goal until the second half. He recorded 13 rebounds, just seven short of that magical 1,000 number. A bright spot for the Bantams was their offensive proficiency, which kept them in the game throughout the first half and part of the second half. The Panthers wore down Trinity’s reliable defense however, shooting 52% from the floor and 46% from 3-point range. Senior Chris Turnbull was another bright spot in what is likely the final game of his career. He led all scorers with 23 points and went 50% from the 3-point line. The Trinity Bantams end the season with a 16-10 record and an impressive fourth straight appearance in the NESCAC semifinals.